Per a testimonial on the longevity of our financial model development for a Private Public Partnership involving the prisons service…. We wish to confirm that SACM hired AuditExcel in 2003 to adapt an Access funding model into an Excel model as we needed the ability to make our own changes and not rely on external contractors. The resultant template that AuditExcel developed was audited by KPMG and accepted by the lenders. The model is still in use and has stood the test of time with regular legislative and macro-economic changes. 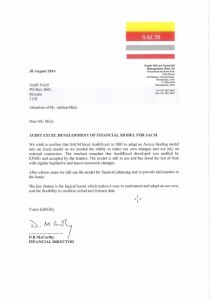 After eleven years we still use the model for financial planning and to provide information to the banks. The key feature is the logical layout which makes it easy to understand and adapt on our own, and the flexibility to combine actual and forecast data.